Just like humans, dogs and cats are prone to allergic skin disorders. There are three main causes of allergic skin disorders in dogs and cats: flea allergy dermatitis, food allergy dermatitis and atopic dermatitis. Fleas are a year round problem, but seem to be worse during the summer months. Animals with flea allergy dermatitis don’t have to be covered in fleas to suffer from severe skin issues. 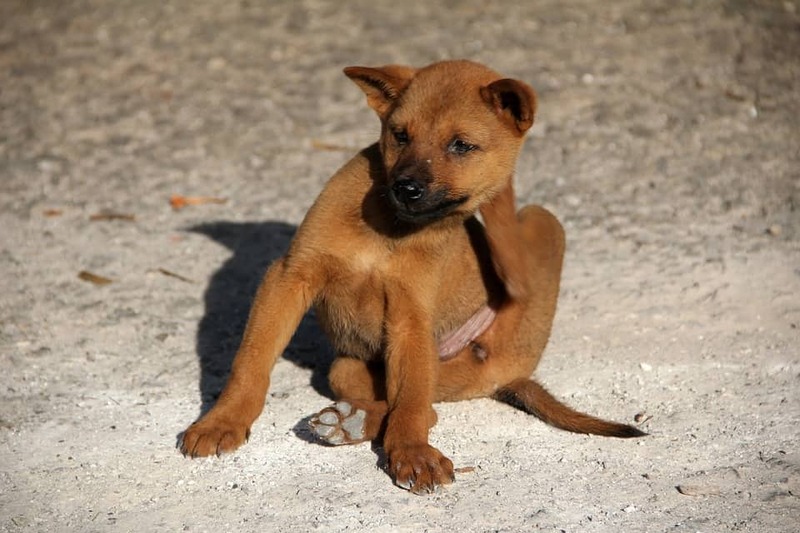 Flea allergy dermatitis is an allergy to the flea saliva- just one bite can trigger an episode in susceptible dogs and cats. Regular flea control is key to treating fleas and flea allergy dermatitis. Most of the flea life cycle – the eggs and larval stages – live in the environment (ie. your backyard, carpet and pets bedding! ), it is only the adult fleas that you will see on your pet. So it is important to not only treat your pets with a preventative product but also to eliminate flea eggs and larvae from the surrounding environment. Vacuum the entire house (even floorboards) after placing flea products on your animals to ‘wake up’ larval flea stages in the house. The adult fleas then jump on your animals and quickly die from the product. Washing and drying all bedding on the line in the sun also helps control environmental flea burden. For dogs and cats struggling with flea issues we recommend a product called BRAVECTO. Bravecto comes as a 3 monthly chew or 6 monthly spot on for dogs, and a 3 monthly spot on for cats. It provides highly effective flea and tick control in both species, affecting all stages of the flea lifecycle. Food allergy isn’t specifically a summer issue and can occur in dogs and cats of any age. Despite the recent popularity of ‘grain-free’ diets for pets, true food allergies are more commonly caused by meat proteins- with beef, chicken, lamb and fish being the most common offenders in dogs. Dogs and cats are often allergic to more than one thing. We will often recommend a diet trial with a hypoallergenic food for 8-12 weeks after which the pet is ‘challenged’ with one particular food at a time to discover what sets off the allergic reaction. Atopic dermatitis is the name given to skin allergies in response to inhaled allergens. These allergens vary and can include pollens, dust mites, tobacco smoke and fungal spores. Atopic dermatitis is often diagnosed by a process of elimination. Animals with suspect allergic disorders are placed on flea control and a diet trial for 8 weeks. If no response is seen to these treatments then atopic dermatitis is the most likely cause of allergies. At Southern Cross Vets we can perform a HESKA blood test on your pet to help identify what allergen your atopic pet is allergic to. If an allergen is identified it is often possible to create ‘vaccinations’ to desensitise your pet to the allergen. Allergy medication can also be provided to give your pet relief from itchiness. Many animals present to the clinic with bacterial or fungal skin infections. These are diagnosed by collecting a sample from the surface of the skin with sticky tape and looking under the microscope for organisms. Often the bacteria or fungi seen under the microscope are normal flora of the skin- but they have proliferated into abnormally high numbers. This occurs when a predisposing factor disrupts the normal balance of skin flora. Factors that may affect skin flora include underlying allergic disorders, cuts and scratches, moist environment created by thick fur and warm days. Hot spots are an example of a commonly seen skin infection in dogs. Hot spots often occur in dogs with thick coats and in warm weather. Underlying allergic disorders can lead to recurrent issues with hot spots. Hot spots are nasty painful skin infections that can lead to sloughing of fur and skin. They appear quickly and spread quickly. What happens in a skin consult? When your dog or cat is presented for a skin consult to one of our vets, we do our best to get to the bottom of the issue! This involves taking a comprehensive history, physical examination and taking some samples from your pet. Samples we may take could include sticky tape impressions, hair, skin scrapings and swabs of wounds. Skin issues usually aren’t an easy fix. Multiple visits and tests may be required to get to the bottom of your animal’s problem. A skin check with one of our experienced and friendly vets is the best way to catch skin disease early and leads to more effective treatment. It is not normal for your dog and cat to be constantly scratching, imagine how you would feel having itchy skin all the time! Remember if you haven’t been to us before your first consultation is FREE!